With affordable flower and basket options and guaranteed same day shipping on many items, this makes For You Flowers ideal for last minute shoppers. From You Flowers is a same-day flower and gift basket delivery service. They made a name for themselves as one of the few vendors that offered true same-day delivery options. By partnering with local merchants, they can deliver those last-minute gifts you need all at an affordable price. A gift basket vendor featuring towers, baskets and non-edibles for every occasion. The variety is rather impressive from From You Flowers, but that is because they have a variety of network partners flooding their inventory – in a good way. When you start browsing, you could easily be overwhelmed by all of the choices, including chocolate baskets, fruits, cheeses, wines, snack packs, candy packages, jewelry, spa baskets and even teddy bears. They include plenty of brand names in their basket selections, including Starbucks in their coffee ones, all of the big names in candy (Starburst, Reese’s, etc), Lays and other snack leaders, Coca-Cola, Godiva, etc. They have a few non-edible options, which include spa gift baskets, teddy bear baskets and baskets with jewelry, but the majority are edible concoctions. Because it is a relatively big company with a large network, you have a lot more customization options when you opt for From You Flowers as opposed to lesser known gift basket companies. 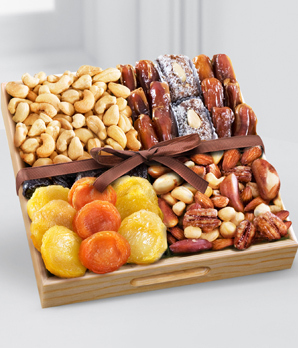 First, you can opt for the Regular, Deluxe and Premium baskets on almost all gift baskets on their site. Deluxe is what is shown by default on the site, while regular will be slightly smaller in presentation. Premium varies in size significantly, but is the largest size. Next, you can make it special by adding more to the basket including Mylar balloons, chocolate, latex balloons, teddy bears and cards. They do not allow you to swap out any ingredients and they do not have a design-your-own feature like some companies do. There are plenty of holiday-themed baskets to choose from, but they are only released close to the holiday. So Easter baskets are not available until March/April, while Halloween baskets are only available September through October. When it comes to sentiments, they have quite a few to choose from including birthdays, sympathy, love, get well, just because, new baby, funeral, anniversary, graduation, thank you, congratulations, etc. They have one of the largest sentiment lists so far, but that is also because they have a large network fueling their options. They also have an everyday category that includes things like snacking, game day, etc. They do not offer vegan, sugar-free or gluten-free baskets, but they do have a few Kosher options. From You Flowers has an entire department dedicated to corporate services. They offer member discounts and corporate accounts for businesses that want to order multiple baskets or continue to order in the future. They do offer bulk ordering so that companies can thank their entire member base or even send out bulk holiday gifts. They offer streamlined billing and corporate members can also customize their baskets with their logo, a co-branded gift card and other promotional items. Prices are about average for From You Flowers gift baskets. Because a lot come with free local delivery, the prices can be slightly higher than other companies. On average, baskets range from $30 to $200. They do offer sale baskets and specials for the holidays as well. Unfortunately they do not provide weight or sizes of baskets on their website, but they do offer full-size products and a hearty helping of items per basket. From You Flowers is one of the few that offers a true same day delivery. While other companies rely on overnight shipping, From You Flowers has a network of local providers that can actually deliver the basket. The shipping rates will vary. Same day often comes with a hefty price tag of $39.99 while some deliveries can be as low as free or $2.99 for same day. It depends on the basket. There is a service fee of $2.99 for most orders and some orders will be taxed as well. Online their baskets are very attractive and they do specify which basket they are showing (regular, deluxe, premium). They offer wine in a select few baskets and do make it clear that they cannot ship wine to all states. When you order from From You Flowers, you can also order for international deliveries, but not for APO/FPO packages. They will, however, give all orders a delivery date specification. The majority of their items come in baskets, while there are a few that feature boxes. When ordering, you can choose a gift card for every basket. Cards are categorized by the sentiment or can be ordered blank. You are limited to 175 characters for the card and a signature. The company does offer a 100 percent satisfaction guarantee. If you are not satisfied with their service, they will offer a refund or deliver a new product. They are available 24 hours per day to answer any concerns regarding their baskets or the quality of the items in the baskets as well. Customer service is available 24 hours per day, 7 days per week with From You Flowers. They have a team available via their toll-free number and email, but there is no live chat. They do also have a track order page and a My Account page for better order management. Their FAQs section, unfortunately, is very clunky and difficult to read, so we hope that they improve this soon. As of right now, they carry an A rating with the BBB and are accredited. There are a lot of complaints, but they resolve them through the BBB and also encourage customers to contact them directly. Considering they are such a large volume company and deal with networks, it is not uncommon to see a high number of issues – but they do always follow through and correct them. Under $50 – There are a few baskets under this price point and if you opt for the “regular” option you can get some baskets that are normally over $50 for under $50 (but they are notably smaller). These will typically include trick-or-treat or small sized candy bags rather than full-size. $50 to $100 – For this price range you can get gourmet food baskets and even baskets with bottles of wine or fruit baskets. They have some sentiment options that include non-edible items as well (like teddy bears for new arrival baskets). 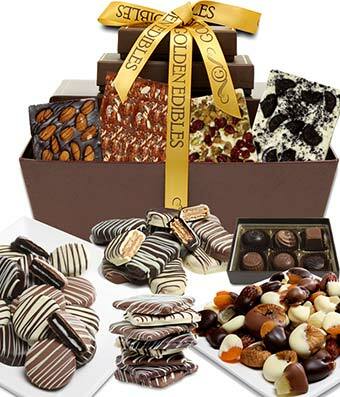 A large majority of their gift baskets fall into this price range. $100 to $200 – The other half of From You Flowers’ baskets fall into this price range. They are heartier in this price point and include full-size bags and options. $200 and up – There is a very limited number of baskets over $200, but for the price you can find grander baskets – typically designed for group gifting rather than a single person. These include baskets full of treats, fruits, full-sized bottles of wine, etc. From You Flowers works for just about every type of shopper and recipient. They have a wide range of products in their gift baskets. But, what makes them extra helpful is their same day delivery. Because of their slightly higher prices, they may be more ideal for those shopping last minute and need something now, but they also work well for those that are looking for a great basket without spending tons in shipping costs. We really like the same day delivery option. While some vendors will say they offer last minute shopping, very few can actually deliver a basket the exact same day it is delivered. They indicate on their site which baskets are eligible for same day delivery and you can still include a future delivery date. We also enjoy that you can increase or decrease the size of the basket to suit your budget and add-on extras to customize it a little more – something not all gift basket retailers offer. While they are impressive, their overnight shipping can be $33 or more on top of a basket, quickly taking a basket out of the budget-friendly range. We don’t like that they do not list weight or sizes of products in the baskets on their site – this can deceive customers when shopping into thinking they are getting something bigger than they actually are. Some do have sizes, but the majority of baskets on the site do not. Also, their FAQs and information is a little lacking and hard to find. If they could beef that up, it would make it easier for shoppers to find out everything they need to know. Under $50 - There are a few baskets under this price point and if you opt for the “regular” option you can get some baskets that are normally over $50 for under $50 (but they are notably smaller). These will typically include trick-or-treat or small sized candy bags rather than full-size. $50 to $100 - For this price range you can get gourmet food baskets and even baskets with bottles of wine or fruit baskets. They have some sentiment options that include non-edible items as well (like teddy bears for new arrival baskets). A large majority of their gift baskets fall into this price range. $100 to $200 - The other half of From You Flowers’ baskets fall into this price range. They are heartier in this price point and include full-size bags and options. 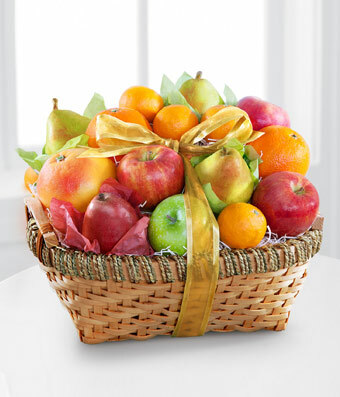 $200 and up - There is a very limited number of baskets over $200, but for the price you can find grander baskets - typically designed for group gifting rather than a single person. These include baskets full of treats, fruits, full-sized bottles of wine, etc.